Yes I get lazy washing my hair, simply because my hair takes the longest time to dry! I seem to just sit there moving my hair dry around for agesss getting hot a flustered and feeling like I need a cup of ice to cool down after. But my hair gets so greasy so quickly mainly because I have such a bad habit of repeatedly touching and moving my hair throughout the day so this method is so great for me! Dry Shampoo is such a life saver at times but I seem to get through them so quickly and CONFESSION I cannot stand the smell. I know a lot of people will be shocked to hear that but I just find the smell so chemically and sickening so I’ve found a way to get rid of the greasiness without adding a nasty smell and not spending so much money on them damn aerosols. Place a small amount of baby powder to your palms and rub them together. Comb through your hair getting rid of any knots and massage into your scalp. This will absorb the greasiness and give a mattefied finish! BUT, make sure you comb through your hair removing any white residue and you’re good to go! I LOVE this method and find it is also great at adding a little bit of volume when applied to freshly washed hair. 2. Add an Omph to your lashes! The wonderful Baby Powder can also help you get dramatic, longer and thicker eyelashes!! Apply one layer of mascara as usual. Dip your cotton bud in some baby powder. Lightly dust this on to your eyelashes. Apply another layer of mascara. This gives you a more dramatic, thicker look and the illusion of falsies without the hassle of glue! Do you already use this method? So way before the unlimited amounts of translucent and pressed face powders - Baby powder used to be my go to product to help set my foundation and stop it transferring all over the shop. Although I use this method a lot less now it's great for when your favourite powder has hit pan and you need to lock in your coverage. 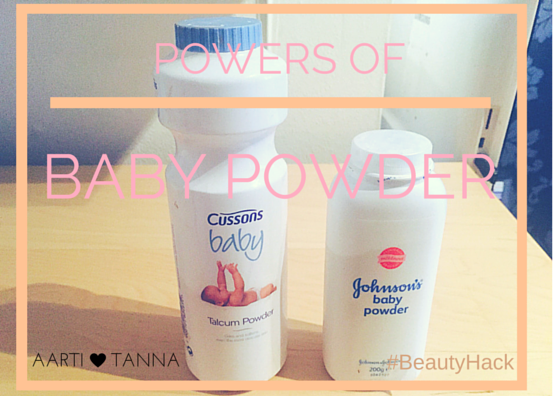 I never thought of using baby powder as a dry shampoo! Great tips!